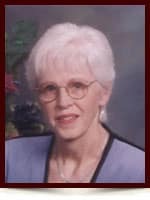 Mary Elizabeth Mackie (nee McDonald) - Edmonton's Burial & Cremation Professionals | Trinity Funeral Home Ltd.
Mary Elizabeth Mackie (nee McDonald) died unexpectedly and peacefully, surrounded by her husband, children, and grandchildren on February, 20, 2015 at the age of 79. Mary is survived by her husband, Robert Mackie of Westlock, (formerly of Edmonton) Alberta; children, Paula Paton (Richard), Rod Morrison, Bev Berentes (Steve), Lisa Murphy (Pat), Darin Morrison (Lisa), and Derek Morrison (Kathy); step children, Greg Mackie (Cindy), Brad Mackie (Grace) and Arlene Woidak (Kelly); grandchildren, Chris Paton (Brandy), Deanna Chavez (Eddie), Jill Godin (Shane), Jon Paton (Jen), Alexandrea Berentes (Carl), Tyler Berentes, Kara Murphy, Kyle Morrison, Tory Massey, Chase Massey, Kristen Murphy, Brady Massey, Keelan Morrison, Teagan Morrison, Emmalysse Morrison; great grandchildren, Joey Chavez, Lucas Chavez, Raena Paton, Londyn Godin and Avery Godin; siblings, Henrietta (Dolly) McDonald (Alexa), John McDonald (Liz), Jane Sinclair, and Robert McDonald (Sheila); and numerous nieces and nephews. She is preceded in death by her parents Fred McDonald and Evelyn McDonald (nee Burns) and daughters Marilyn McDonald and Marlene Lamothe (nee Morrison). The family would like to thank the doctors and staff at the Grey Nuns Emergency for their special care and support. February 26, 2015, 3:00 P.M. Please accept the Ganter families sincere condolences on the death of Mary. Thank you all for your heartfelt condolences. Mom was a very special person, who will be missed greatly. Our deepest sympathies to Aunt Mary’s family and friends on her passing. A special person who will be missed by all who had the good fortune to have known her. My sincere sympathy at the passing of your mom. Mary helped to bring me into this world at the Winchester Hospital. She will be greatly missed by many. I will always consider Mary as my sister in law. Sincere sympathies to all Mary’s family. Many good memories of a very special lady. From all of the Rice Family. Mother Mary was very special to me. Mother Mary was my foster mother, but much more than that. She gave me confidence when I had none, get gave me courage when I had none, she made me believe in myself, and she gave me hope for my future. Even when Mary was going through such hardship when Rod was in the hospital, Mary told me when I went back home that her home was always open for me and she would always be there if I needed her. She had a profound effect on me, and the reason why I was able to reach higher than I would have if I had not had Mary. Mary you can now soar — there is no body to slow you down. I know you will be watching over all of us. Rest in Peace – you have more than earned it! With all of my Love. Mary was a very sweet and lovely lady, she will be truly missed by all the people she touched in her life. Our deepest sympathies from our family to yours. Please accept my deepest condolences on the death of your Mom. She was a very special person! You are all in my thoughts and prayers. I am sorry that I and my family (Gail, Allen,Peter) will not be able to attend your Mom’s Celebration of Life. We would have liked to be there. Distance makes it harder for relatives to get together it seems. Our thoughts are with all of you during this time. We will surely miss your Mom. Our deepest sympathies. Aunt Mary touched so many lives, she will be missed.